We cannot observe the way the distant universe accelerates cosmic rays or produces energetic photons, but acceleration processes also occur on our Sun, though on a much more moderate scale. Starting in 1942, Geiger counters and other detectors, set up to monitor cosmic rays, have occasionally seen sudden increases in the intensity of the radiation, associated with outbursts on the Sun, mostly with visible flares. The cosmic ray intensity returns to normal within minutes or hours, as the acceleration process ends and as accelerated ions disperse throughout interplanetary space. On the scale of cosmic radiation, solar-produced ions have relatively low energies, generally below 1 Gev (=billion electron volts) and rarely above 10 Gev. That is why such events are often missed by cosmic ray detectors near the equator, where the lowest energies are excluded by the Earth's magnetic field. The best detectors for observing solar particles are therefore those sensitive to the lowest energies of the cosmic radiation. In many events the Sun emits enormous numbers of lower-energy ions, with no more than tens of Mev (=millions electron volts). The Earth's magnetic field diverts them to the vicinity of the magnetic poles, where they may temporarily smother the ionosphere and interfere with radio communications. Such "polar cap blackouts" used to bother US military radar installations which scanned the polar cap for hostile missiles. Electrons are also accelerated by solar events, though to lower energies. Since electrons are much lighter than positive ions, they are more tightly held by the Sun's magnetic field lines. They are also more likely to lose energy in the form of radio waves, x-rays and gamma rays (the same as magnetospheric electrons). Thus they often do not escape, but their presence is indicated by other emissions, e.g. the bright x-rays seen by Yohkoh. Solar acceleration events are often accompanied by bursts of x-rays, sometimes reaching their peak intensity within seconds and thus suggesting an equally abrupt acceleration process. The GOES monitoring satellites of US National Oceanic and Atmospheric Administration (NOAA), observing the weather from synchronous orbit, also keep tabs on the Sun's activity by means of sensitive x-ray detectors. Oh, how do solar astrophysicists wish they knew where and how do these solar particles get their energy! The general consensus is, however, that the energy of accelerated solar ions and electrons is derived from the magnetic fields that rise above sunspots. It is not just that magnetic fields are generally associated with particle acceleration, but also, no other available source could release energy so quickly. While searching for an explanation of particle acceleration on the Sun, British researchers in the 1950s, in particular Peter Sweet and James Dungey, proposed the idea of magnetic reconnection, an idea later applied to the Earth's magnetosphere and to substorms. Reconnection is still believed to be the energy source of flares and CMEs, but unfortunately, it seems to happen in the lower corona, where magnetic structures are invisible (with a few exceptions--see picture below). The nature of substorms and solar acceleration events may indeed be similar, though their scales differ greatly. However, satellites can be sent to substorms but not to the Sun, and therefore magnetospheric research may well hold clues to some of the problems of solar physics. Theorists have proposed that reconnection and acceleration on the Sun occur near the tops of magnetic "arches," of field lines rising from sunspot regions, like the one pictured above. 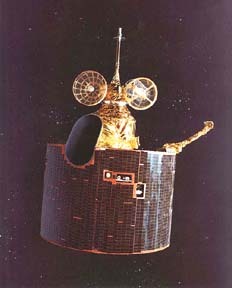 When the Solar Maximum Mission in 1981 spotted on the Sun's surface two bright pin-point sources of x-rays, appearing at the beginning of an acceleration event, it was widely assumed that they marked the impact of beams of electrons accelerated at the top of an "arch" and guided by its field lines down to the Sun. More recently, the Japanese x-ray imager aboard the Yohkoh satellite has observed a bright x-ray source formed at the top of an arch (picture on right), lending further support to the theory. Flare seen in X-rays by Yohkoh. Note added May 1997. The solar observatory SOHO, located near the L1 Lagrangian point, has provided additional evidence for reconnection at the Sun, by observing bi-directional jets of fast-flowing plasma. Quoting from an article by D.E. Innes et al (Nature, 24 April 1997, p. 811; see also p. 760): "...we report ultraviolet observations of explosive events in the solar chromosphere that reveal the existence of bi-directional plasma jets from small sites above the solar surface. The structure of these jets evolves in the manner predicted by theoretical models of magnetic reconnection, thereby lending strong support to the view that reconnection is the fundamental process for accelerating plasma on the Sun." Should we be concerned about solar energetic radiation? On Earth we are safe, protected by the thick layer of our atmosphere, equivalent to 10 meters (32 feet) of water or about 4 meters of concrete. Astronauts on a space station orbiting near the Earth's equator are protected by the Earth's magnetic field. However, astronauts on their way (say) to Mars, separated from space by just a thin metal shell, are quite vulnerable. Luckily, life threatening radiation events are rare, especially during low years of the sunspot cycle. Still, as the large particle events of August 1972 have shown, some danger remains even then. This is the last regular section of "Exploration of the Earth's Magnetosphere." We hope you have enjoyed your visit!